Fingerhut has long since been the name many associate with home shopping – and these days, it offers many of the name brand items we already shop for. In recent years, it’s added electronics, including MP3 players and computers. It’s become a formidable opponent, both in catalog and internet sales. The Fingerhut credit card is as advertised. The response is quick, just as the website promises, and the customers – both new and long time, have been satisfied with the convenience. 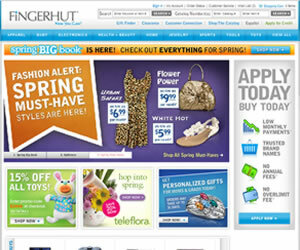 Like all other shopping credit cards, you can use it only to purchase items sold by Fingerhut. The lack of annual or monthly fees is always a good thing and this is one advantage store cards have over traditional credit cards. Fingerhut reports to all three credit bureaus, too, which is good for those who are working to build or rebuild their credit histories. For those whose credit scores are a bit lower, there’s a good chance the credit limit will be considerably less than one who has a stronger credit history. An initial line of credit of $100 may be offered for those who meet the very minimum criteria, though historically, Fingerhut has always been quick to raise those limits once payments have been made on time, usually within six months, though sometimes as long as one year. We discovered in the online application the need for name, address, social security number and annual income. We didn’t run into any of the employment requirements such as the employer name, address, length of time with the employer, etc. Further, we were not asked about our banking history or even the name of our bank. That’s not to say, however, all customers will be able to avoid that time consuming process. Perhaps one of the most impressive features of the Fingerhut card is the online account access. In this area, which is encrypted for security, customers may view their account activity, their most recent statement, review the terms and conditions and even make a payment. Further, account holders may track their orders and follow their returns until the merchandise is received by the company and their accounts adjusted accordingly. A bit further down the page, the standard options are easily found, such as the ability to update debit card and credit card information used to make payments and email, password and communication preferences. Customers are encouraged to also set up a security question and answer to provide an additional layer of security. In the Terms and Conditions, you’ll discover the APR, your responsibilities as a consumer as well as your rights. There is a 25 day grace period and late payments are charged an additional $30 as are returned payments by your bank. The minimum amount of interest your account will be charged is no less than $1. We also discovered a new program offered by Fingerhut and Meta Bank. For many customers who are initially turned down for the traditional credit offer, Meta Bank and Fingerhut are now offering a FreshStart program. This allows customers to pay a small down payment on their first purchase and once the initial balance is paid in full over six months and provided there were no late fees or NSF check charges the company will then extend the Fingerhut card with no down payments required. This has proven quite successful, especially considering the increasing number of Americans who are picking up the pieces following the recession. More information can be found on the Fingerhut website. After our research, we discovered that while Fingerhut maintains its long-held popularity, it has remained current with its customer base’s needs, such as the FreshStart program. As mentioned, the interest rate is comparable to other store charge cards and the approval process is easy as well. It’s certainly worth your consideration if you’re looking for an easy account process with many name brand offerings and with a company that’s been established for many years. A Credit Card that Charges 79.9% APR? Consumer Credit Card Protection Law 2010′ – A Blessing or Curse? I have a fingerhut card. Can I still use it? Yes sure – you can use your Fingerhut card.